pH is a measurement of whether a substance is an acid or a base and how strong it is. 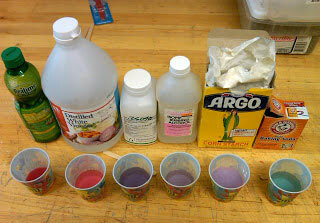 We will be using red cabbage juice as an indicator to show if the solutions we use to test the Law of Conservation of Matter have changed after a chemical reaction. 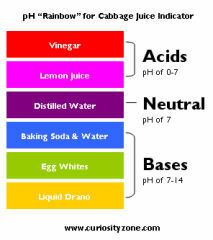 The purple juice changes to different colors when mixed with an acid or a base as shown below.